Father Jerry serves full-time in Eugene at St. George Greek Orthodox Church, where he resides with his family. In addition to serving at St. George, Father Jerry currently serves, on a part-time basis both the Greek Orthodox Mission Church of Salem and Holy Cross Greek Orthodox Mission of Roseburg. In November of 2002, Father was ordained to the Holy Priesthood and entered into full-time ministry work. 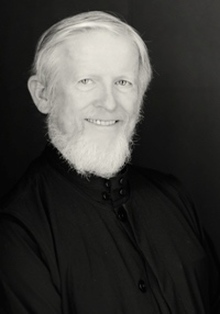 Prior to coming to St. George, Father served as the Associate Priest at Holy Trinity Cathedral in Portland, Oregon. He has led many youth and adult retreats, summer camps, and has devoted himself to hospital ministry, prison ministry, visiting shut-ins, supporting his brother priests, the study of church growth, strategic planning, and renewal. While in Portland Father was instrumental in the founding of Agia Sophia Academy, an Orthodox Christian School. Fr. Alban West holds a B.A. in Classics from Reed College in Portland, Oregon (1993) and an M.Div. from Holy Cross Greek Orthodox School of Theology in Brookline, Massachusetts (1997). He was ordained to the Holy Priesthood in 1997 and from that same year he has served as pastor of St George Antiochian Orthodox Church of Portland, Oregon. In 2004 he was elevated to the dignity of Archpriest. Since 1988 he has been married to his high-school sweetheart, Khouria Krista West, a master tailor and scholar of the Orthodox Christian vestment tradition. They reside with two of their three daughters in Salem where they enjoy spending their family time together singing, hiking, and skiing. Fr. Edward Hillhouse, was born in Wisconsin, then soon traveled to Virginia and ended up in 13 different schools from San Diego to Alaska, as a Navy brat. These enriching experiences helped make him a better teacher, which he had had a vision of doing by the age of 14. He pursued his goal of becoming a school teacher through the education department at California Baptist University. After seven years teaching third grade in Riverside, California, Fr. Ed moved to the Santa Cruz area where he worked in the cleaning, landscaping, and hardwood floors businesses before helping to start an Orthodox school. He taught grades five through eight in his parish school for 16 years before moving to the Portland area. He currently teaches at Agia Sophia Academy since 2006, a position he feels privileged to fulfill. 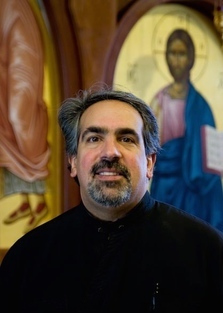 He also serves as an assistant priest at St George Orthodox Church in Portland and serves once per month at the Greek Orthodox Mission Church of Salem.